If you are the last user of the day, especially later in the day, please turn off the mercury arc lamp when you are finished. If you plan to use this microscope for more than ~30 minutes at a time please book ahead at the Leica Inverted microscope booking page. The left side port transmits 100% or 0% of the light with a magnification of 0.63x to a B/W high sensitivity Photmetrics HQ2 or Hamamatsu Orca ER CCD camera. The top trinocular port transmits 100% or 50% or 0% of light to a Q-Imaging MicroPublisher CCD color camera and has a 1x magnification. Its suggested to leave it in the 50%/50% position. Fluorescence filter cube for far-red emitting fluorophores (e.g. Cy5, Alexa 633) is stored in the plastic tub on the shelf above the scope. Clean install of the system (April 25, 2014) - All users must setup C-Imaging profiles again. See Michael for assistance or see here for online instructions. Comparison of the Cameras attached to the Leica Inverted Microscope - which one to use? 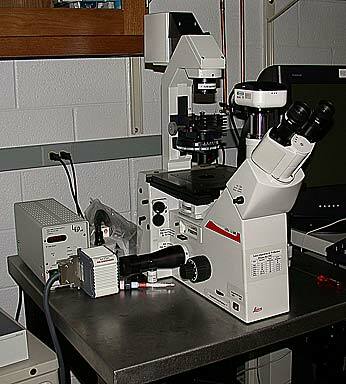 The Leica microscope is a standard inverted microscope set up for transmitted light, differential interference contrast (DIC or Nomarski) and fluorescence microscopy. Images may be viewed by eye or viewed and saved to computer with either of 2 cameras. 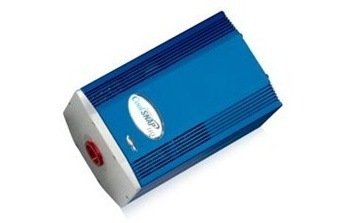 For transmitted light and very bright fluorescence imaging a chilled color camera is mounted on top of the trinocular and can be used to capture high resolution digital images. For dimly fluorescent samples or photometric quantification, a cooled B/W CCD camera (an HQ2) made by Photometrics is attached to the side port on the left of the microscope. DIC images may also be captured using either camera, although the color camera can capture with higher resolution. Darkfield is also available forthe 40x & 63x oil immersion objectives. The specific hardware attached to this microscopy is listed below. * These objectives prefer a number #1.5 (~170 um thick) glass cover slip. Changing between S1, S23 & S70 requires a 3 mm hex wrench so unlock the condensor assemble and slide the top to match the S number on the stem of the microscope. Please keep a hand under the condensor when you do this in order to prevent the assembly falling onto the objective. The MHMICROSCOPY file server is accessible from this workstations (Snell) computer. Many users' directories are at \\minsky\users2. This shared directory can be mapped to the M: drive on your log in. Switch on Hamamatsu camera control box. Switch on computer, if it is not already running. Close field iris (2) until you see a ring. Focus the image of the ring with the condenser focus knob (5), and center it with the 2 knurled screws at 45 degrees. Open condenser aperture (4) to desired contrast. Remember maximum resolution is obtained with a fully open aperture, which also gives minimum depth of focus & contrast and maximum illumination intensity. Open light path from mercury lamp by pulling rod on back left of scope out. 1st position out includes an IR filter (don't use) and all the way out removes the IR filter. Images can be acquired with either camera using C-Imaging. For the MicroPublisher camera, the QCapture software may be used instead. Choose QCapture N.B. clicking on these links should open a view in another window. This window may be hidden behind other windows on your computer.